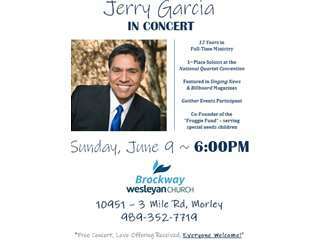 Join your friends at Brockway Wesleyan Church for an amazing evening of gospel music with Jerry Garcia on Sunday, June 9th at 6pm! From Jerry’s Bio: Gospel Music Artist Jerry Garcia resides in Adrian, Michigan with his wife Sarah. He is the proud father of six special needs children: Kathryn, Emmilee, Jacob, Kaylee, Zoe, and ^Andrew^ who has gone on to be with the Lord. Their ministry is truly a family outreach. They minister to audiences with testimonies of personal challenges and triumphs. Jerry has acquired several awards, performed at the National Quartet Convention in Louisville, Kentucky, shared the stage with many great Gaither Homecoming Friends, and has been recognized in national trade magazines along with appearing on Christian Television. Learn more about Jerry & Sarah Garcia’s ministry online at jlgministries.net. Please call the church at 989-352-7719 with any questions regarding the June 9th concert!